Disney's Star Wars: The Force Awakens took in $8.02 million on Monday to lead the daily box office for an 18th consecutive day. In the process, the seventh installment of the Star Wars franchise passed the $750 million domestic mark yesterday. The Force Awakens was down 63 percent from Sunday and down a sharp 74 percent from last Monday. In comparison, 2009's Avatar experienced a 53 percent daily decline on its third Monday to gross $8.09 million. Yesterday's performance represents the first time The Force Awakens has finished behind Avatar in the daily comparison between the two films. While that is a sign of relative slowing for The Force Awakens going forward, yesterday's decline may also point to The Force Awakens skewing more towards family audiences than Avatar did. In the bigger picture, with an 18-day gross of $750.23 million, The Force Awakens is already on the verge of surpassing the $760.51 million unadjusted lifetime domestic gross of Avatar. The Force Awakens is set to surpass Avatar on Wednesday (and could possibly do it today instead) to become the highest grossing unadjusted film of all-time domestically. The film is currently running 108 percent ahead of the $360.21 million 18-day take of Avatar and 48 percent ahead of the $506.90 million 18-day gross of last year's Jurassic World. When adjusting for ticket price inflation, The Force Awakens is in 18th place on the all-time adjusted list and will surpass the lifetime adjusted gross of 1999's The Phantom Menace today to move into 17th place. Overseas, Star Wars: The Force Awakens took in an estimated $14.5 million on Monday. The film has now grossed $786.1 million overseas and $1.536 billion globally. Paramount's Daddy's Home remained strong with a second place take of $2.21 million. The PG-13 rated comedy starring Will Ferrell and Mark Wahlberg declined 65 percent from Sunday and 65 percent from last Monday. Daddy's Home is already on the verge of reaching the $100 million mark with a stronger than expected eleven-day take of $96.10 million. That places the film an impressive 33 percent ahead of the $72.21 million eleven-day gross of 2010's The Other Guys. 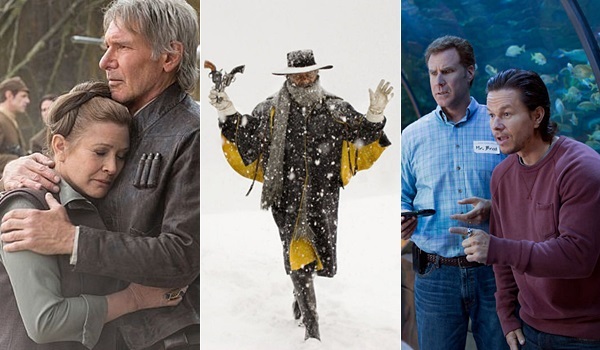 The Weinstein Company's The Hateful Eight claimed third place with $1.56 million. The Quentin Tarantino directed western was down 53 percent from Sunday, which represented one of the day's stronger daily percentage holds among wide releases. On the heels of its strong roadshow start over Christmas weekend, The Hateful Eight has had a much more modest performance since expanding into wide release last Wednesday. The film crossed the $30 million mark yesterday and has grossed $30.60 million in eleven days. The Hateful Eight will soon be facing new direct competition from Fox's The Revenant when that film expands into wide release on Friday. Universal's Sisters and Fox's Alvin and the Chipmunks: The Road Chip occupied fourth and fifth place with respective daily takes of $1.13 million and $0.95 million. Sisters declined 61 percent from Sunday, while The Road Chip fell 66 percent. Respective 18-day grosses stand at $68.59 million for The Road Chip and at $63.02 million for Sisters. Both films continue to display strong holding power, as Alvin and the Chipmunks: The Road Chip has a current total gross to opening weekend ratio of 4.80 to 1 and Sisters has a ratio of 4.53 to 1. Paramount's The Big Short and Fox's Joy claimed sixth and seventh place with respective grosses of $0.81 million and $0.79 million. The Big Short was down 58 percent from Sunday, while Joy was down 62 percent. Joy has grossed $39.31 million in eleven days, while The Big Short has grossed $33.87 million in 25 days. However, given its stronger holding power thus far and its upcoming expansion on Friday, the total gross for The Big Short should have no problem moving past the total gross for Joy before much longer.